Relatively inexpensive, authentic, New York-style Jewish deli that serves a mean corned beef sandwich. : Vintage-cool décor and a hip diner vibe pervade this space, which fills with business people and students from Columbia College next door. 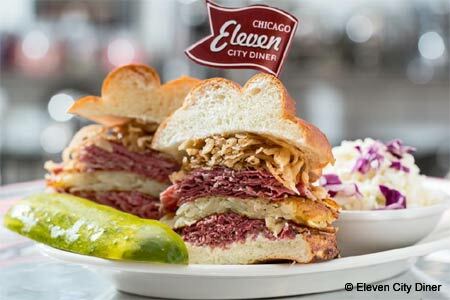 Start with mini Reuben sandwiches, followed by The Woody Allen, a triple-decker sandwich from Carnegie Deli in New York that alternates corned beef and pastrami on soft rye. If you come for dinner, count on heftier options, too, like tender brisket or tilapia with red wine citrus salsa. As for sides, be sure to get an order of pickles and pickled green tomatoes, and save room for the moist chocolate cake finale. There’s an in-house soda jerk, so don’t be shy about slurping nothing more than a Green River float or Brooklyn egg cream.